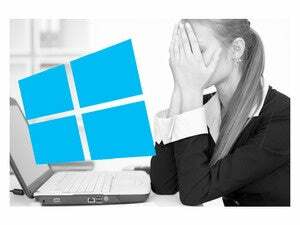 Windows 10 is not as eye-bleedingly bad as previous versions, so all hail Microsoft! Once again we see that there is nothing Apple can possess that Microsoft cannot take away. Yes, unlike Windows 8, Windows 10 does not literally make you set your PC on fire out of sheer frustration! Is there no end to Microsoft’s genius? Surely this is bad news for Apple. I don’t know if I broke a law of computing or committed heresy. BUT I BLACKED OUT AND THERE’S ANIMAL BLOOD ALL OVER MY ALTAIR 8800, OH, GOD. But I installed Windows 10 on my MacBook Pro. Dude, the Macalope has run Windows, Linux, and Android on his MacBook. And his head looks like a Classic Mac. Try to get over yourself. That’s a joke, of course. Not getting over himself is kind of Wadhwa’s thing. I had feared that this would condemn me to purgatory in the gates of computing hell. Apple’s a religion, everybody. Get it? Microsoft applications run faster in Microsoft’s own operating system, you say? Surely this stunning revelation changes everything. OS X, we are left to presume, is the fruit fly-infested black banana of operating systems. I had thought I would never install a Microsoft operating system ever again after my experience with Windows 8. It was terrible: inelegant, difficult, and expensive. But after seeing this, all the years of confusing interfaces and user experiences are forgiven. But I still needed the Microsoft Office tools, because they are industrial strength and Apple still has no products that are as good. To use these, I had to load Windows and Office under VMWare on my MacBook. If only someone made a version of Office for the Mac. OH, WELL. Instead of getting the best of both worlds, though, I got the worst: pathetically slow applications, poor battery life, and inconsistent user interfaces. I chose to use two different operating systems and was afflicted by inconsistent user interfaces. Also, I keep jabbing this pencil into my leg and I can’t figure out why my leg hurts so much. Several CIOs told me that I was out of touch with Microsoft’s new products. The CIOs said that Microsoft is a much better company to deal with than Apple, which has become known for arrogance and a lack of concern for the needs of enterprise customers. It’s a shame that caring about users instead of CIOs hasn’t worked out for them. The Macalope is not a privacy expert, he’s not even an actual person, but from where he’s sitting this does not seem good for protecting your privacy. And guess what! Nadella said it’s NBD! Well, to be fair, this is exactly the kind of cozy-with-the-elite opining we’ve come to expect from the Washington Post. If we expected anything more than taking a person in power’s word for something, well, that’s on us. He assured me that Microsoft was in touch with customer needs, and all of the CIOs I spoke with agreed with his assessment. You could barely see Nadella’s lips move when they did! They looked so lifelike! I would not suggest that anyone use its default installation settings. They grant Microsoft the right to use your data to market to you, to automatically connect you to Wi-Fi networks and marketing “beacons,” and to sell some of your information. But all of these options can be turned off. True! It doesn’t do any good, but they can be turned off! Sometimes flicking a switch that does nothing just makes you feel better. Microsoft is actually being more honest than other technology companies are that do much of this without informing customers and hide details in the lengthy contracts that no one reads. Truly our privacy-devouring overlords should be praised instead of pilloried. No reasonable person would deny this. Given that Microsoft is providing Windows 10 for free to the majority of its customers, this is a small inconvenience for people who really care about their privacy or don’t want to be marketed to. Privacy concerns are an outdated anachronism. So jejune. Very pre-Swiftian. Taylor, not Jonathan. Microsoft 2.0! Now with all the same concerns you have about Google! The Macalope has used Windows 10, and he agrees it’s easier to use than Windows 8 (not that that’s saying much). But in order to pay for this “free” operating system to run Office, the albatross of application suites, it appears you’ll either have to be a corporation or someone who doesn’t care that much about their privacy. If only there were some other way.